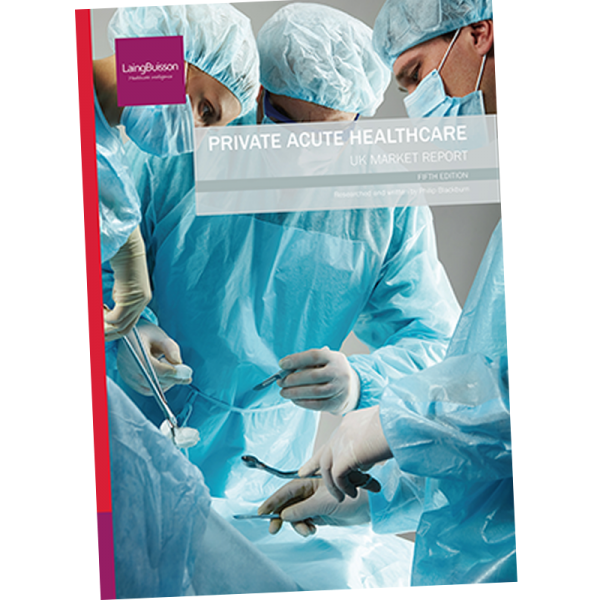 The private acute medical care hospitals and clinics market (the independent sector + NHS private patient services) was worth an estimated £5.78 billion in 2017. 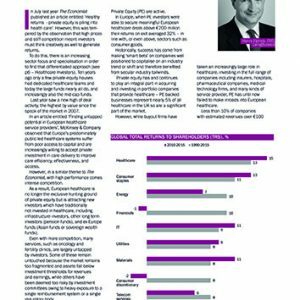 Mixed market conditions were highlighted as real growth slowed from 4.2% in 2015 to just 2.5% in real terms during 2016 – and the market experienced a contraction in real terms, growing by just 0.6% in 2017. 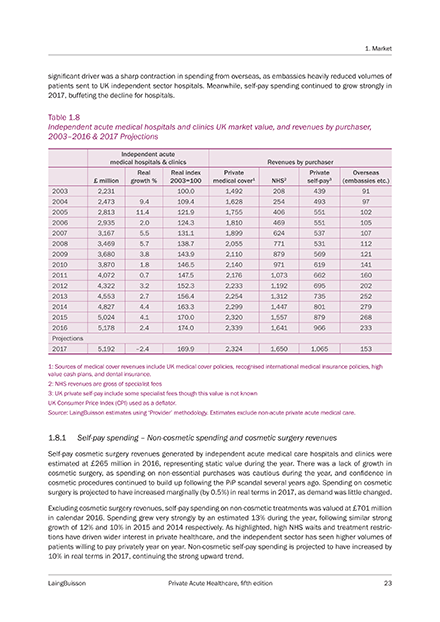 While NHS demand for services flattened, embassies in the Gulf States/Middle East reduced their overseas spending, and medical cover payouts were softer, there remains a strong self-pay demand as a larger number of customers have been willing to pay for private acute medical care. 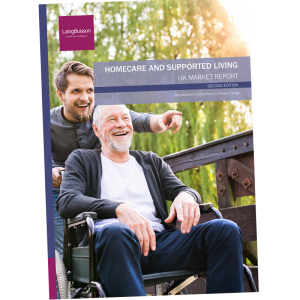 The report focuses on the challenges and opportunities that current and future demand trends define for sector providers at a time when some trends have recently shifted significantly. 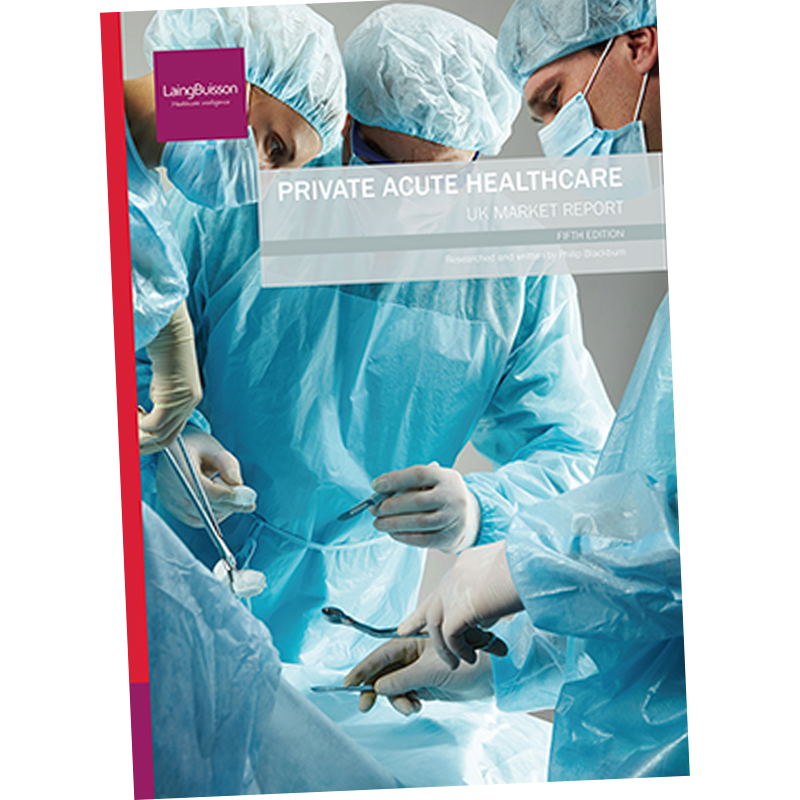 Acute medical care providers are now evolving strategies to anticipate future demand behaviour, and LaingBuisson’s report provides valuable insight and analysis to support this. 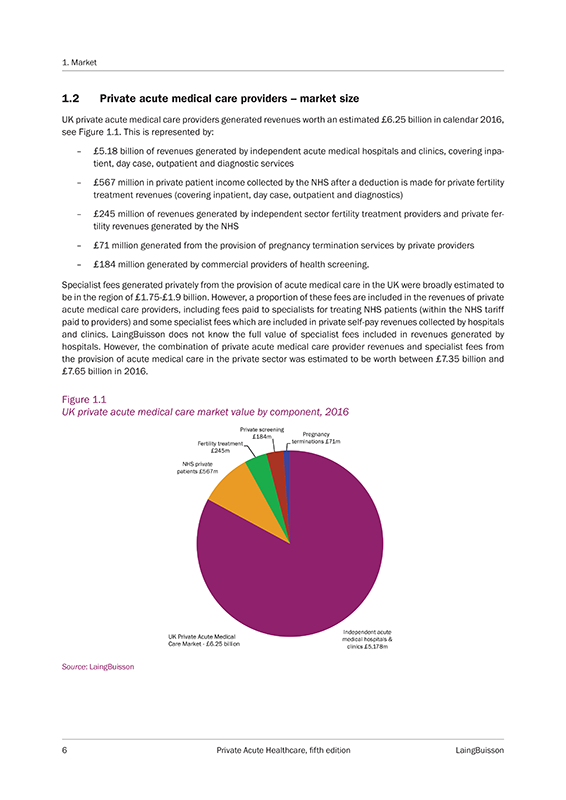 The next 12 to 18 months will shed more light on the direction of NHS demand, as NHS providers spend additional (Autumn Budget) funding to clear NHS waiting lists, and NHS contracting arrangements continue to develop. 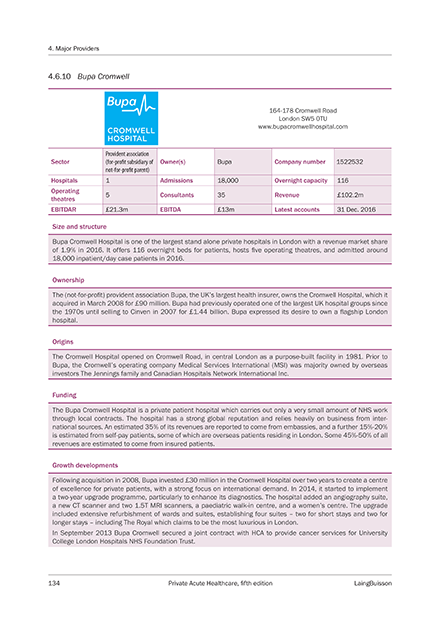 Providers will also be looking for more favourable dynamics from overseas demand for private care, following a market check in recent times. 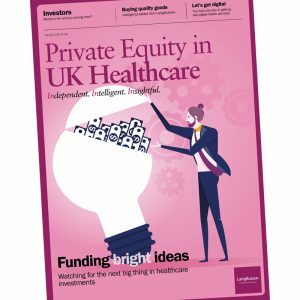 An underlying strength of the market remains strong interest in private healthcare from individuals looking to pay for quick and convenient diagnosis and treatment. 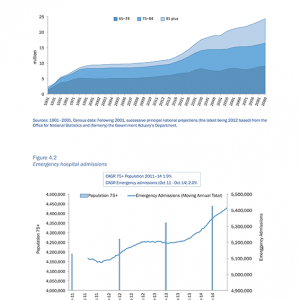 High NHS waits and the scope for development of private healthcare are expected to support continued strong growth in this area. 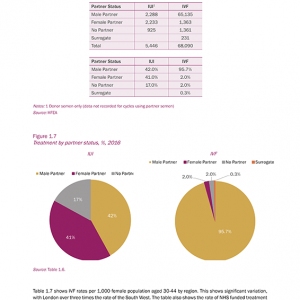 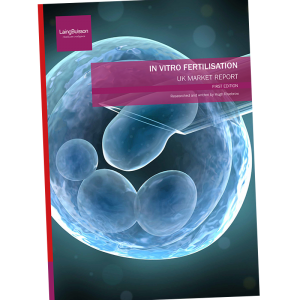 And as this report highlights there are several significant new entrants from overseas and domestically which are bringing new capacity and delivery concepts into the private market which highlights optimism of future growth, and UK incumbents are busy developing new service propositions to accommodate a more comprehensive patient pathway within private healthcare. 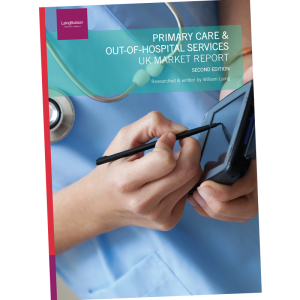 Another central theme within the report is the increased focus on quality of services and patient outcomes within the healthcare sector.